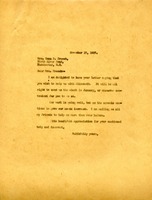 Letter, possibly from the sponsor of a child, inquiring about her well being. The author indicates she has just "passed 85th birthday" and has been ill and unable to send money for the child. 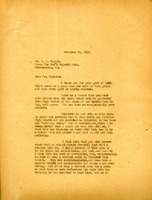 Mr. Taylor writes to pay for Elizabeth's tuition and asks for an update on how she and Elsie are doing. 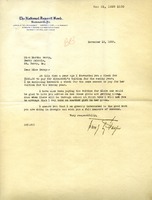 Miss Berry writes to thank Mr. Taylor for his donation. She tells him a little bit about Elsie and Elizabeth. She explains what she thinks about students staying or leaving The Berry Schools. 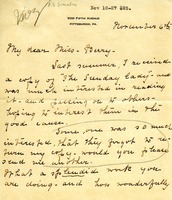 Ida Spurr encloses a donation toward Elizabeth's tuition. Frederic Vaux Wistar encloses a contribution in support of Elizabeth. A donation of $2,500 for an endowed scholarship is given to the schools by Mrs. William Moore. John D. Williams donates $100 to the Berry Schools. Scholarship donor form with appeal to help Elizabeth, a student that got pneumonia. Recipient sent $150 for a scholarship. Mrs. Snowdon read "The Sunday Lady" and became interested in Miss Berry's splendid work. She shared it with her friends but one of them forgot to return Mrs. Snowdon's copy, so she requests another. She wishes she could send a $1,000 check but there are too many calls on her income so she sent a $25 check. In a postscript, she asks if Miss Berry has enough money to keep Elizabeth in school for the next year. May sends a donation to support Elizabeth, saying "I like her looks." She reports on a dinner with Mr. and Mrs. Downer and sends New Year's wishes. Receipt for annual scholarship. Artical about Elizabeth's need and illness. This check for $300 is to go towards a student named Elizabeth's education at Berry. The form's second page contains the story of Elizabeth, who developed pneumonia. Elizabeth will have to drop out of school unless the recipient helps. Recipient, Mrs. Morris Hawkes, gave a $150 scholarship. 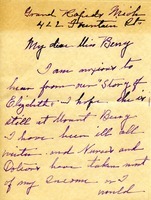 This is a letter from Miss Berry to Mrs. French thanking her for helping with Elizabeth. She requests that the check be sent in January or whenever Mrs. French can. Recipient donated $150 for an annual Scholarship. A page of the form tells the story of Elizabeth, a student with pneumonia who would have to drop out of school because she could not work due to her illness.